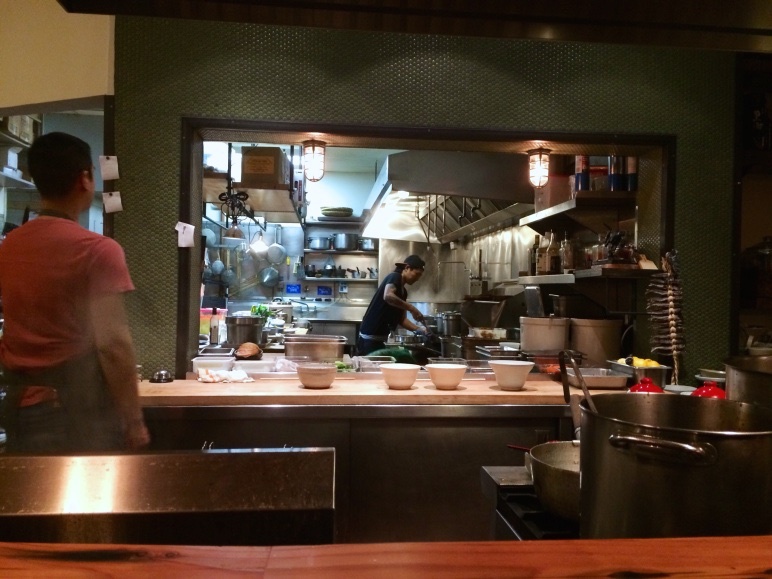 Ramen has unequivocally invaded the Bay Area. The idea of going out to eat ramen as if it were as pervasive as Thai food or even a burger, is a phenomenon that has only recently taken shape in the Bay. Take, for example, Orenchi Ramen which just opened up on the Valencia corridor and already has lines with over two hour long waits. The secret is out and people cannot get enough of this hearty Japanese noodle soup. The Ramen Shop, which opened in early 2013, caters to the trendy 20/30 somethings that are moving to the “more affordable” East Bay in droves. Though one can certainly find families with their young kids and older couples here, the majority of people who dine here fit the profile of the young, techie start-up demographic. While it is questionable whether or not anyone on the kitchen staff is is even Japanese, these chefs really know how to make an unforgettable bowl of ramen. Arriving to The Ramen Shop for an early dinner, the hostess informed us that we were lucky to only have a 45 minute wait. Sauntering along College Avenue in Oakland, we almost succumbed to the tantalizing smell coming from Zachary’s pizzeria from right across the street. In the end, our patience rewarded us with some incredible food. For starters, we shared the chashu donburi with bonito nanbanzuke, scallions, ginger, kombu, meyer lemon Tokyo turnips, and pickled shiitake mushrooms. Reminiscent of a Korean bibimbap, the runny egg yolk added a nice creaminess to the rice bowl. Sitting at the counter allowed us to watch the kitchen’s front of house literally working non-stop to produce one bowl of ramen after another. Before dunking the ramen noodles into the boiling water, the sous chef would yell, “dropping!”. Then the second cook would start getting the bowls ready to be filled with piping hot broth. Since these slender ramen noodles are freshly made, they only take a mere couple of minutes to cook, just so they have that perfect elastic snap. We sat at the bar and watched this repetitive dance around the kitchen that goes on all night, for the entirety of our meal. Finally, when the non-identical ceramic bowls were placed in front of us, we took our time eating this substantial soup, and did not let a single drop of broth go to waste. In general, many vegetarian ramens lack the umami flavor that pork bone bestows to tonkotsu ramen. However, this vegetarian ramen certainly surpassed expectations and had a brawny flavor. Indisputably, the best part of this vegetarian bowl of ramen was the egg. The opaque egg white cradles the custard-like yolk. Resting in repose at the top of the bowl, the egg adds a perfect touch to this wonderful assemblage of comfort food.